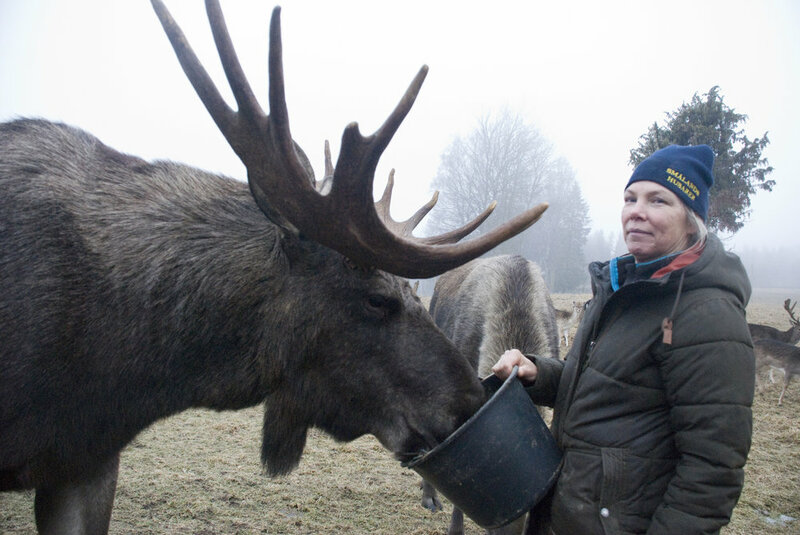 I'm pretty sure Eleanor was joking when she suggested I reach out to the moose preserve in Eksjo, Sweden, to see if I could meet the moose even though the park is closed for the winter. I don't joke about moose, though. I'd already gotten up early that morning to write them and plead my case. 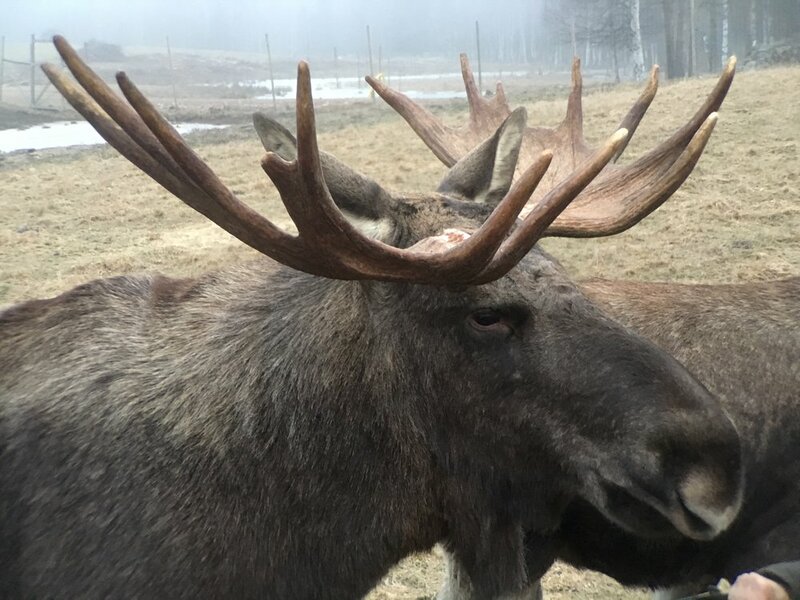 American Musician Seeks Moose Encounter. Less than 24 hours later, Swedish moose expert Erik and his mother were taking me and my host Emma on private dawn tour of the Skullaryd Algpark. 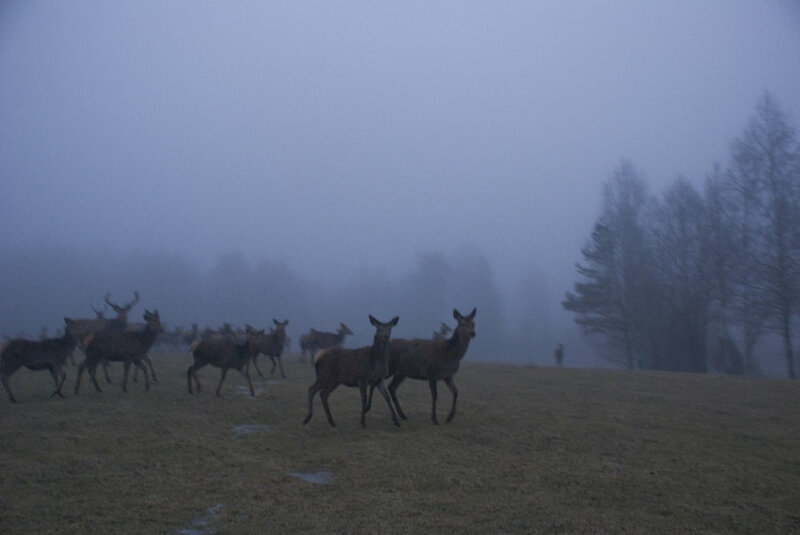 They have dozens of red deer and fallow deer along with eight big, beautiful moose. I got to meet them up close and personal and pet them and we're all friends now. I've never been that close to a moose before, and good lord they're enormous. 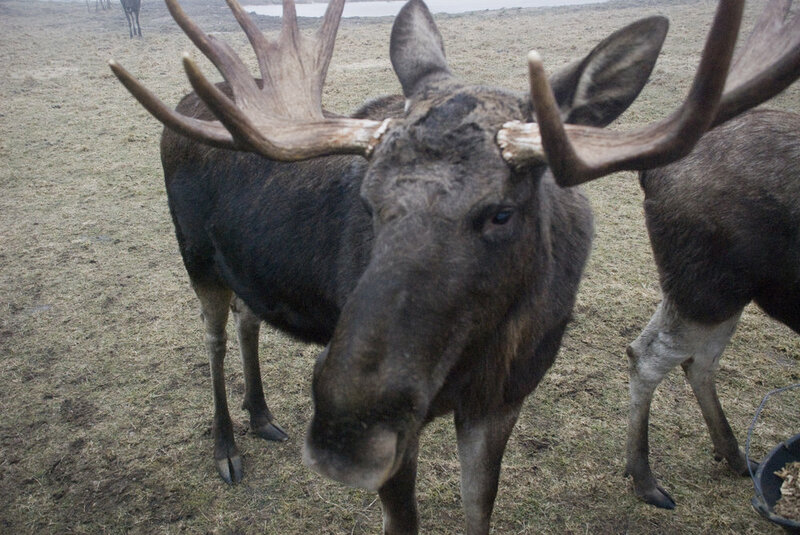 They only make one sound when they're talking to each other (Erik can recreate it perfectly and get their attention), and they'd knock antlers competing for food, but for the most part they were gentle giants. It was gorgeous and foggy and mysterious when we got there, but as the morning wore on, the sun came out for the first time this whole trip and cast a warm glow over everything. The world may be going down the tubes around us, but this will go down as one of my favorite days on tour ever. My sincere thanks to everyone who made it possible! Last night we played a private show in an old converted barn heated by wood burning stoves. We're way out in the country here, so you could see a million stars in the sky. Apparently old American cars are popular here, and the owner of a '59 Ford invited me to cruise with his car club if I come back in the summer. Emma cooked us a delicious dinner in her 100+ year old house (a former orphanage) and we played with her dog and watched a little news before the show. Like I said before, American politics is a big deal here. It's constantly being covered in Swedish and in English. Everybody has an opinion on Trump and expresses their concern that the same thing will happen here in Sweden when their election rolls around. 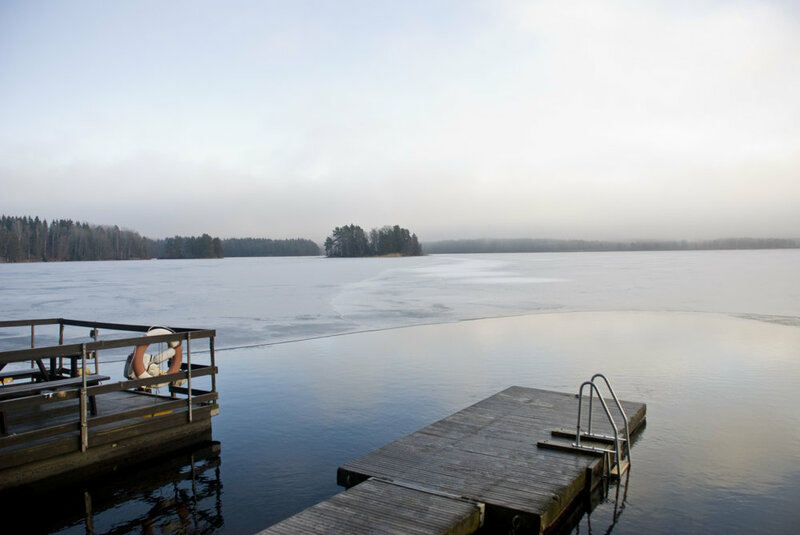 It was an early show, so when we got back to the lodge, I made way down the icy steps to the sauna building by the edge of the frozen lake and enjoyed a peaceful steam looking out into the cold Swedish night. Today we head to Avesta to join back up with Joshua James and play the Rootsy Music festival. Rootsy puts on all the best tours in Sweden, and they've been cool enough to present the last few nights with us. Tomorrow night we head down to Gothenburg to play another festival date with my old pals Shovels & Rope, plus Promised Land Sound and Matthew Logan Vazquez. We're in the midst of a 10-nights-in-a-row run here, but we can see our off days on the horizon, dangling the promise of sleep and a little vocal rest just out of our reach.